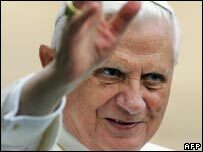 There are at least two reasons why Pope Benedict may have decided peremptorily against a private meeting with Ms Rice. First, it was Ms Rice who just before the outbreak of the Iraq war in March 2003 made it clear to a special papal envoy sent from Rome, Cardinal Pio Laghi, that the Bush administration was not interested in the views of the late Pope on the immorality of launching its planned military offensive. Secondly, the US has responded in a manner considered unacceptable at the Vatican to the protection of the rights of Iraqi Christians under the new Iraqi constitution. The Bush administration has told the Vatican that as coalition forces have not succeeded in securing the whole territory of Iraq, they are unable to protect non-Muslims. Instead of meeting the Pope, Ms Rice had to make do with a telephone conversation with the Vatican's number two, Cardinal Tarcisio Bertone, who was visiting the US during August on other business.